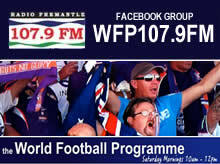 Join The World Football Programme Team this Saturday on Radio Fremantle 107.9fm Radio for 2 hours of football from 10am WA time. Hosts Penny Tanner and Peter Szkiela line up a huge list of guests including Scott Miller (Cockburn City), Doug Hesketh (Mandurah City), women’s football guest, Peter Filopoulos (Perth Glory), Ray Gatt (The Australian Newspaper), Peter Hugg (former Football West CEO). The agenda includes wraps of major men’s and women’s leagues, ALeague finals and Socceroos World Cup Qualifiers. We’ll share some good social platforms for football news and keep you informed of the latest local and national footballing news. Supply us your club news via facebook post or text us on 0408921832 between 10-12noon this Saturday on 107.9fm.